The XL version of the Circle Pad Pro looks a lot like the original 3DS iteration - and yes, it will make your 3DS XL even bigger. Several months ago, Nintendo announced that its Circle Pad Pro, which adds an additional thumb-stick to the 3DS, would be released for the 3DS XL as well. Today, the first image of the reworked peripheral surfaced on Nintendo's Japanese website. 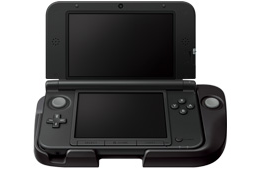 In the end, it doesn't look very dissimilar from the 3DS version of the Circle Pad Pro. Details are still scant on the pricing of the peripheral or, for that matter, when it will actually be released. In fact, they haven't even explicitly stated that it will be released outside of Japan, but given that the original Circle Pad Pro made its way across the Pacific, it's probably a safe bet that we'll see it in stores here soon enough. The desire for dual-analog controls on the 3DS is understandable, but with a peripheral, developers need to support it too. And some developers don't: Take Kid Icarus Uprising developer Masahiro Sakurai, who said that "Providing support for independent analog control was something that was technically impossible." It does make you wonder just how useful a peripheral like this might be. But on the other hand, you get to make your 3DS XL take up even more space!